Thank you for your interest in the Washoe County Sheriff's Office monthly eNewsletter, "Community Partnership Connection". Your personal safety and enhancing the quality of life in our region is our highest concern. These publications offer practical and valuable information that can help keep you and your family safe while also providing resources and contacts for you to make informed decisions. It's also an opportunity to know more about your Sheriff's Office: our programs, services and the partnerships we maintain within our community. Use this form to subscribe to the monthly WCSO Community Partnership Connection eNewsletter. Join us at the Nevada Day and Veterans Day Parades! The Sheriff's Office is sporting beards and mustaches for Movember! The Sheriff's Office is "Going Pink" in October! You're invited to the Washoe County Sheriff's Office Open House September 29th! Former K9 Kir Awarded Kinetic Performance "K9 of the Year"
Crossroads program wins national award! Save the Date! Join us on September 29th for our Sheriff's Office Open House. 10 Things you will want to know as the weather heats up. Washoe County Sheriff's Office Records Section will reduce hours on August 10th for staff training. Are y'all ready for a Reno Rodeo Dance-off? Cops and Burgers - Come join us on June 5th! Sheriff's Office prepares to saddle up new Mounted Horse Unit! National Public Safety Telecommunicators Week - A Salute to our Dispatchers! Washoe County Sheriff's Office is taking the plunge for Special Olympics! SO participates in the Northern Nevada Children's Cancer Foundations "Go for the Gold Ferris Wheel Challenge"
Washoe County Search and Rescue Celebrates 50th Anniversary! The Washoe County Sheriff's Office reminds residents to check their outdoor Christmas light displays, especially when using laser beam holiday lighting. Holiday Shopping - Safety Refresher! Washoe County Honorary Deputy Sheriff's Association presents $40,000 check to Wal Mart for year's "Shop with the Sheriff"
FAQ of the Month: What are the qualifications for becoming a Deputy Sheriff? Sheriff's Office Now has Outreach Deputies at Five Elementary Schools! "Joining Forces: 2015 Best Overall Joining Forces Reporting Agency"
This month two WCSO Communication Specialists traveled up to Idaho to help with communications on the Cougar Fire. WCSO Records and Civil Sections will now be open a half hour earlier! Add a Little Color to your Life! Volunteer for "Color Me Rad" and support Special Olympics. Sheriff's Office Lieutenant is "Law Enforcement Officer of the Year"
Free Community Emergency Response Training Academy Begins July 9th! Sign up today! Wandering Vulnerable persons are a growing concern in northern Nevada...we want to keep those you love or care for safe. We just hit 5000 likes on our Facebook. Don't miss our "thank you" video! Join Local Cops for some Classic Cars and Tasty Chow...all for a great cause at the Cops and Burgers Show-N-Shine May 31st! WCSO participating in WCR Fashion Show- A Tribute to Heroes on May 29th! FAQ of the Month: I had a great/poor experience with one of your staff and i would like to report it. How can I do that? Sheriff's Office and TMFPD Invite Public to Play in "Guns and Hoses" Golf Tournament on May 4th! Supporting the Kids Kottage Shelter for abused and neglected children. FAQ of the Month: How can my neighbors and I start a Neighborhood Watch program? "Copsicles" Receives Award for Special Olympics Polar Plunge! Online Tax Filing a Hit with Taxpayers - and Thieves! Know Someone Interested in a Rewarding Career in Law Enforcement? FAQ of the Month: Can you recommend a CCW instructor? Our Sheriff's Office "Hero with Heart"
FAQ of the Month: I am seeing information about "Warrant Wednesday" in the news. What is it and what can I do? Chuck Allen Takes Oath of Office as the 26th Sheriff of Washoe County! FAQ of the Month: I or someone I know is interested in becoming a Deputy/working for the Sheriff's Office. What are the qualifications? A Christmas card from our family to yours! FAQ of the Month: If I see RAVEN, does that mean I should stay inside? Chuck Allen to be sworn in as 26th Sheriff of Washoe County on January 5! FAQ of the Month: I really like your children's safety activity book. How canI get some for my children/students? FAQ of the Month: Do you ever use student interns or volunteers in the crime lab? Prescription Drug Round-Up on September 27th! FAQ of the Month: My neighbors play loud music throughout the night and early morning. Can I call non-emergency dispatch to help? VFW Post Honors Deputy Sita Singh as "Law Enforcement Officer of the Year"
FAQ of the Month: I have witnessed drug activity in my neighborhood. What should I do? FAQ of the Month: There is an abandoned vehicle in my neighborhood. Who do I call to report it? Scammers Going "Phishing"...It's Not Your Day in Court! FAQ of the Month: I am a recreational target shooter. Where can I go to lawfully shoot? Active Assailant Video "Run. Retreat, Resist" Nominated for an Emmy! Got Graffiti? We have an App for that! FAQ of the Month: If I don't want to come to the Sheriff's Office, can I file and online report or an online tip? FAQ of the Month: Why is RAVEN flying over my house? SO Partners with KNPB for the "Young Writers Workshops"
RAS Microchip Campaign Extended to January 2016! Sheriff's SMART Volunteer is "Someone to Know"! Make Disaster Preparedness Part of Your New Year's Resolution! Get Home Safely on New Year's Eve! KTVN TV and Sheriff's Office Partner on "Safety Watch"
Sheriff's Office Launches Android App! TAKE CONTROL! Don't allow yourself to be a victim of vehicle burglaries. Child Protection - Abduction and Harm: Prevention Tips for Parents and Guardians. Back to School: Traffic Distractions- slow down and watch for children. Nevada Joining Forces grant provides new radar guns for Sheriff's Office. WCSO featured on the reality show "Jail". Regional Animal Services will offer free microchipping during inaugural Sheriff's Office K9 Run on 9-28-13. Are you ready for the next emergency? Now is the time to prepare! Running is for the Dogs...K9's that is! Sheriff's Office invites public to inaugural K9 Run/Walk on September 28th. Look, Listen, and Let Someone Know! Report suspicious activity to law enforcement. Homeland Security begins with hometown security. What can you do? Tim Kuzanek Promoted to Undersheriff. "Joining Forces" DUI Enforcement Campaign. Target Shooting Can Cause Wildfires - Recommendations for Shooting Responsibly. Sheriff's Inmate Work Program aids Reno, Washoe County with Graffiti Abatement. Residents can now report graffiti from their iphones and ipads. Washoe County Sheriff's Office App now available for iPhones and iPads. Regional Animal Services reminds residents to keep their pets safe on 4th of July. Looking for a rewarding career? The SO is currently holding a recruitment drive for Deputy Sheriff applicants. For Cat Owners, Microchips made all the difference in the world. Get along little doggies - a special look at the Reno Rodeo Cattle Drive. Sheriff's Office staff recently attended the National Law Enforcement Memorial in Washington, D.C. The Washoe County Sheriff's Office Citizen Corps is offering a free emergency preparedness and response training academy beginning June 6. Raising Awareness About Child Abuse and Neglect. Prescription Drug Roundup on April 27th. Denim Day is April 24th. Raising awareness regarding misconceptions that surround sexual assault. Pet Microchip Clinics in May. Sheriff Dispatchers Honored with Red Cross Real Hero Award. "Joining Forces" Results for February's Enforcement Efforts. Sheriff's Office Reminds Residents about County Ordinances Governing Target Shooting in Congested Areas. Regional Animal Services is offering FREE Microchips for all your pets for a limited time; find out how you can take advantage of this unprecedented opportunity. Solo, the Chihuahua, was missing for eight months; returns home thanks to a microchip. Run, Retreat, Resist! The Sheriff's Office has joined with KOLO TV - Channel 8 to provide you with valuable information that can help you cope with a workplace active assailant crisis situation, should one arise. Proper emergency training can save you or your family's lives; sign up for the March Community Emergency Response training course today. Risk of car theft increases in the winter. Never leave your vehicle unattended with the engine running. Four important steps that all identity theft victims should take. 10th annual "Shop with the Sheriff" brings Christmas cheer to 200 children! Sheriff's rescue team members save missing kayakers. Search and Rescue volunteers train for deep water rescues. New feature on AlertID helps to protect family members with Alzheimer's or Parkinson's. Planning ahead will help reduce terror of being lost in the wilderness. SO alerts residents of Spanish Springs area of alarming increase in vehicle burglaries. SO receives State Award for Joining Forces "Squad of the Year"
"Twelve Tweets of Holiday Safety"
Victim Advocate Receives a Gift of the "Heart"
Regional Animal Services Launches Community Outreach Campaign on "Hot Dogs"
Emergency Family Preparedness Part 3 of 9 - Preparing for Possible Evacuation. Quiz: How prepared are you for an emergency? Recon, the Sheriff's Office K-9 is featured on the cover of the Nov-Dec issue of K-9 Cop magazine. October is National Cyber Security Awareness Month - 30 tips to keep you safe. Prescription Round-Up on October 29th! Results from the DUI saturation enforcement in June and July. Sheriff's Office alerts public about simulated bath salts that may be the "new high"
Community Emergency Response Teams: You can't predict, but you can prepare! 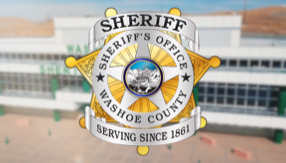 Washoe County Sheriff's "Shop with the Sheriff"